introducing our brand new follow-on course open to puppies/dogs who have previously completed a Puppy School course (or equivalent basic training, e.g. KC Puppy Foundation course). There is no upper age limit. Class numbers are kept small; no more than 8 dogs as an absolute maximum to ensure individual help & attention can be given. Owners will have the opportunity to purchase invaluable training aids, toys and books at classes- all invaluable in helping you teach your dog essential life skills. Exercises progress gradually over the sessions to further your dog's knowledge & development. Each dog will learn at a different rate so there is no need to feel pressured if yours takes a little longer to grasp it, and owners will never be singled out or shamed in any circumstances. Classes are taught by Vicky on Monday evenings at Bradley Green Village Hall. Click here for detailed hall location. We currently have no courses running. 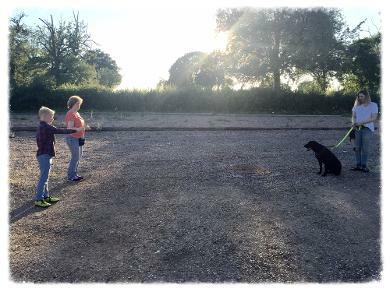 Take a look at our Fun Obedience course here or Life Skills Club here which have upcoming start dates. 2. Once submitted you will receive an email prompt to make payment through Worlpay: a secure online booking system. (Please note; the information from the form you complete will be manually entered by your tutor to generate this, so please be patient and allow up to 24 hours to receive). 3. You will receive further information about your classes and what to bring with you once payment has been made. When did you attend Puppy School classes with us previously? Course start date booking for? Puppy University is specifically designed for puppies/dogs who have undertaken Puppy School training or equivalent basic training. please be aware of this before making a booking.